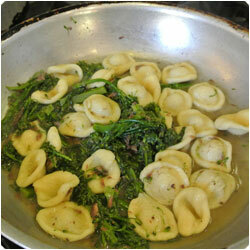 This awesome recipe comes from Rocco, from Tootsie's restaurant in Stanford, Palo Alto, California. He is from Puglia, a region of southern Italy, but he has been living in California for many years: this recipe is one of the most popular and traditional of his region. 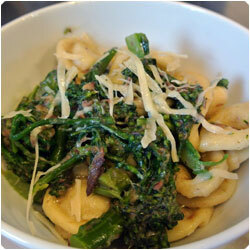 Don't be afraid to make the orecchiette! 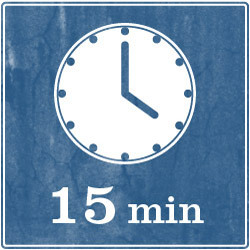 You can make the pasta, the sauce and have your dish ready in 40 minutes! 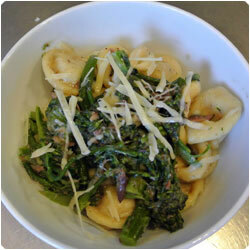 ....Ok, maybe not for the first time, but with a bit of practice you will see that making the orecchiette is really easy! 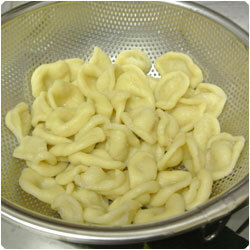 Orecchiette is a kind of pasta that is difficult to make thorugh an automated process. 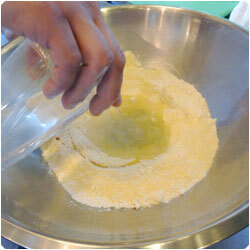 Although some big pasta brands produce them, the shape and the taste are really different. 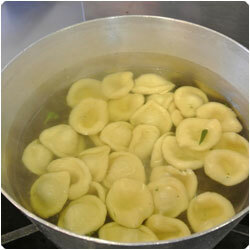 You can find on youtube tons of videos showing italian Grandmas making orecchiette super fast! 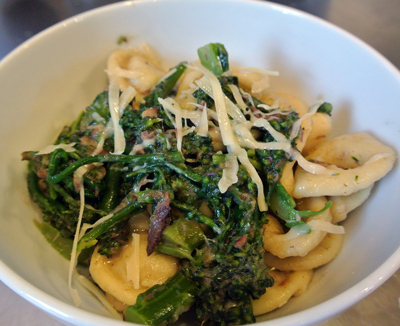 Rocco's sauce is a classic one for orecchiette: the anchovies make it salty and the broccoli, a little bit overcooked, bring the sauce together. 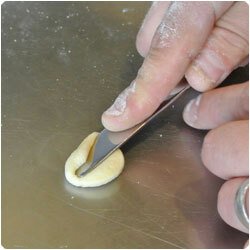 You need a butter knife to roll the orecchiette. 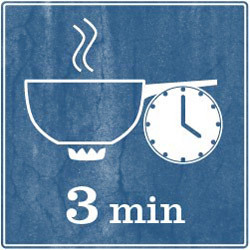 This recipe makes 3 to 4 servings. 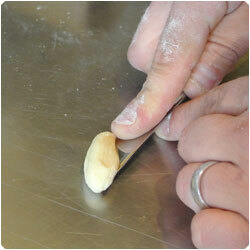 It depends how big you make the orecchiette. Think anyway that each serving wants 60-70g of orecchiete. 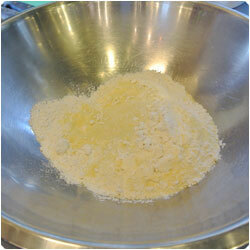 In a bowl mix the semolina flour and the flour. Make them volcano shape. 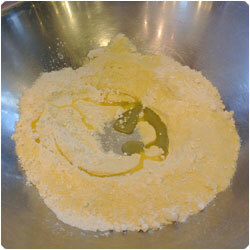 Add the olive oil and the salt. 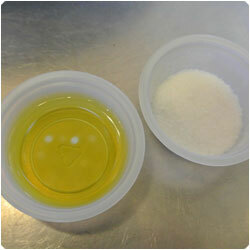 Add the warm water, not all at the same time. 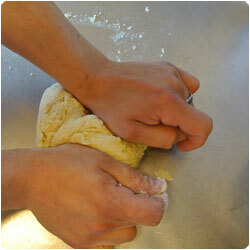 Start to knead with your hand, add more water if needed. 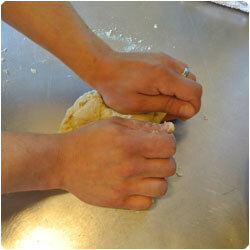 Once the dough starts to get together, form a ball, put it on a working surface and knead it with your hands. 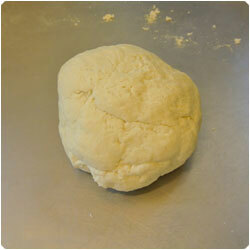 The dough shouldn't be too soft, in case add more flour. 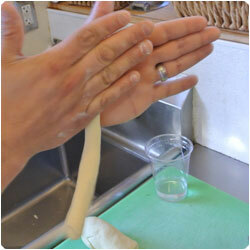 Stretch the dough like in the pictures and fold it with your hands. 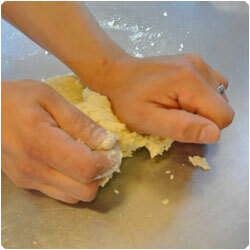 Knead it for few minutes. 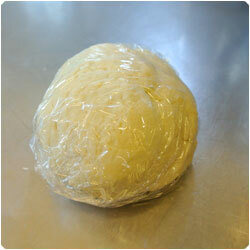 Then form a ball and wrap it with plastic wrap. 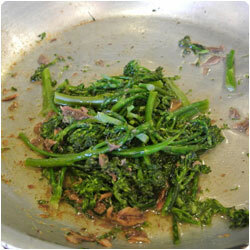 Let it rest at room temperature for about 15 minutes. 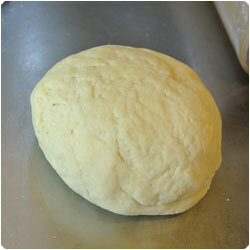 Meanwhile the dough rests you can make the sauce. 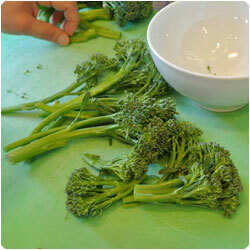 Clean the baby broccoli and cut the stems in half if they are too thick. 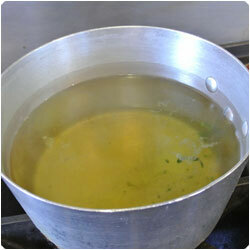 Bring to boil a pot of water and cook them for few minutes. You want them really soft, so let's say for american standard a bit over cooked! 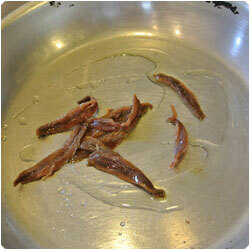 In a pan pour 1 tablespoon of olive oil and add the anchovies. 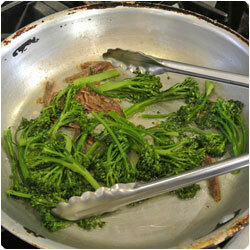 Once the baby broccoli are cooked add them. 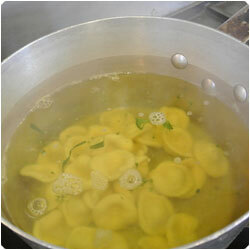 Do not strain them, save the water for the pasta, just pick them with a tongs or a spoon. Let them cook at low fire until the get together. Then turn the heat off. 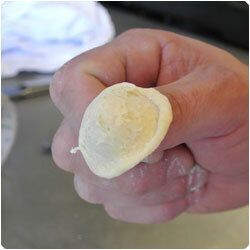 It's time to make the orecchiette! 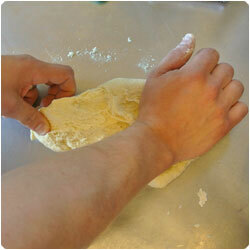 Unwrap the dough and cut them in smaller pieces. Roll the pieces to get 1,5 cm thick logs. 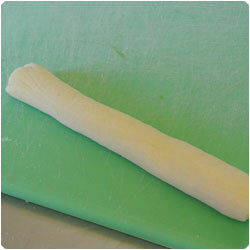 Cut the log in 1cm thick small pieces. 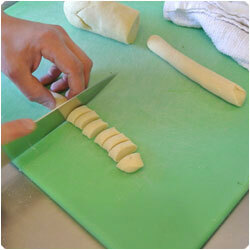 With a butter knife roll the orecchiette as showed in the pictures. You need to press quite a bit the knife (but not too much, you don't want holes in the pasta) and wait that the pasta rolls over your knife compleatly. 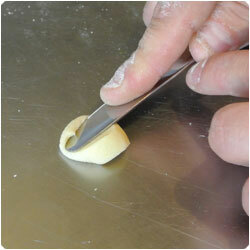 Then, open the roll and, pressing the center with your finger, make it hat shape. Your orecchietta is done! 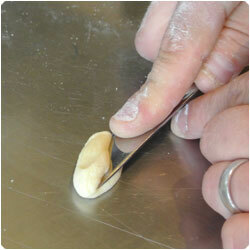 If you still have some doubt you can look at this video that explain how to make the orecchiette. 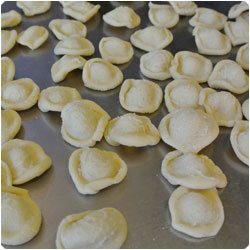 Let the orecchiette dry on a clean surface (if you want to dry them completly, leave them on a net). 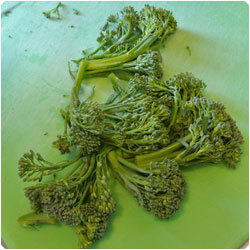 Bring to boil the water where you cooked the broccoli. 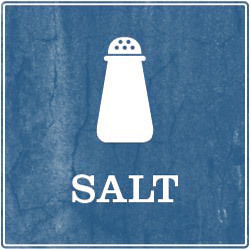 Add salt. 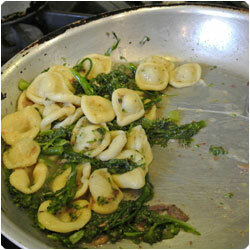 Add the orecchiette and stir occasionally. 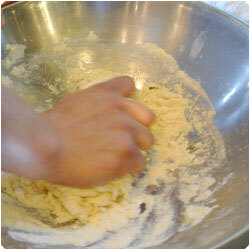 Depending on how thick is the pasta adjust the cooking time, for us it took 3 min. When they are almost done they will come up on the water surface, try one! 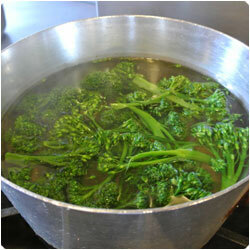 Once they are ready strain them, but before remember to save a glass of water for the sauce! 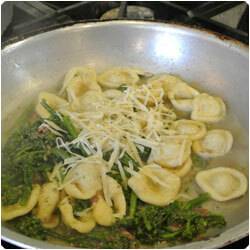 Add the orecchiette in the sauce pan and add some water. Stir. 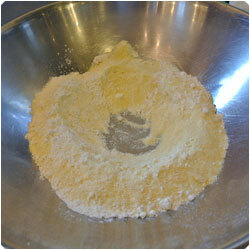 Add parmesan cheese and stir until the sauce homogeneously attach to the pasta. 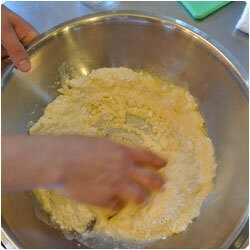 Serve warm and add more parmesan on top if you like.